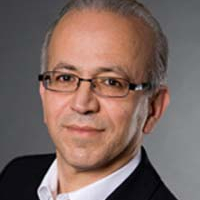 Mohsen A. Jafari is a Professor and Chairman of Industrial and Systems Engineering, School of Engineering, Rutgers, The State University of New Jersey, a Principal at the Rutgers Center for Advanced Infrastructure and Transportation (CAIT) and founder of the Laboratory for Energy Smart Systems (LESS). Since 2006, Professor Jafari’s research focus has been on control and optimization of energy systems with applications in Distributed Energy Resources, smart connected buildings, Demand Side Management, and Electrical Vehicles. Professor Jafari has also been active in research concerning transportation safety and mobility since 2005. Prior to 2005, Professor Jafari’s research focused on additive manufacturing of ceramic actuators and sensors, and intelligent manufacturing in food and pharmaceutical applications. He is one of the pioneers in architecting and building the first multi-material Solid Free Form (SFF) fabrication system with online image-based process control sponsored by the ONR-MURI program. Overall, Professor Jafari has been Principal and Co-principal Investigator to over $23M R&D funding from the US and international government agencies, and industry. Professor Jafari’s work has led to 120 refereed publications and patents. He actively collaborates with universities and national labs in the US and abroad and has advised twenty three Ph.D. theses, and nine post-doctoral and research fellows. Presently, Professor Jafari is advising an additional four Ph.D. theses and one Post-Doc. He is a member of IEEE and was recipient of the IEEE excellence award in service and research, SAP curriculum award and two Transportation safety awards. Professor Jafari has been a consultant to several fortune 500 companies, and national and international government agencies. Automation Sciences with applications in Energy, Transportation and Manufacturing. “A Data-Driven Approach for Driving Safety Prediction Using Driver Behavior and Roadway Information Data,” (with N. Arbabzadeh), IEEE Transactions on Intelligent Transportation Systems, Vol. PP. Issue 99, pp. 1 - 15, 2017. “Network-aware Approach for Energy Storage Planning and Control in a Distribution Network with High Penetration of Renewable”, (with K. Mahani), Applied Energy, Vol. 195, Issue C, pp. 974-990, 2017. “Managing Demand Uncertainty with Cost-for-Deviation Retail Pricing," (with J. Zhu et al. ), Energy and Buildings, 118, pp. 45-56, 2016. “A Hybrid Physics-Based and Data Driven Approach to Optimal Control of Buildings Cooling /Heating Systems,” (with A. Vaghefi et al.) IEEE Transactions on Automation Science and Engineering, Vol. 13, 2, pp. 600-610, 2016. “Resource Allocation with Stochastic Optimal Control Approach,” (with H. Valian), Annals of Operations Research, 239, 2, pp. 625-641, 2016. “Microgrid Investment Under Uncertainty – A Real Option Approach Using Closed Form Contingent Analysis,” (with F. Farzan et al.) Annals of Operations Research, 235, 1, pp. 259-276, 2015. “Investment in Hydrogen Tri-Generation for Wastewater Treatment Plants under Uncertainties,” (with K. Gharyeh and G. Guo), J. of Power Sources, 297, 302-314, Nov. 2015. “Towards Optimal Planning and Operation Control of Microgrids under Uncertainty,” (with F. Farzan), IEEE Transactions on Smart Grid, Vol. 6, 2, pp. 499-507, 2015. “Integration of Demand Dynamics and Investment Decisions on DER,” (with F. Farzan et al.) IEEE Transactions on Smart Grid, Vol. 7, Issue 4, July 2016. “Modeling and Forecasting of Cooling and Electricity Load Demand, “ (with A. Vaghefi), Applied Energy, 01/2014, 136, pp. 186–196, 2014. “Network flow Formulation of Optimal Perimeter Sensory Coverage Problem,” (with D. Golmohammadi) European Journal of Operational Research, 197(1): pp. 77-83, 2009. “Vision based Process Control in Manufacturing Applications,” (with Y. Chang) IEEE Transactions in Automation Sciences and Engineering, Vol. 5, 1, 2008. “Design Tools for Multi-Material Layered Manufacturing System,” (with Saferi et al. ), Ceramic Engineering and Science Proceedings, Volume 21, Issue 4, 2008: pp. 159 – 166. “Coordination Control of Positioning and Deposition in Layered Manufacturing,” (with W. Han) IEEE Transactions on Industrial Electronics, 03/2007, 54(1), 651-659. “Component and agent-based FMS modeling and controller synthesis,” (with W. Han) IEEE Transactions on Systems Man and Cybernetics Part C, Vol. 33, Issue #2, pp. 193-206, 2003. “A Control Switching Theory for Supervisory Control of Discrete Event Systems,” (with H. Darabi) IEEE Transactions on Robotics and Automation, Vol. 19, issue #1, pp. 131-137, 2003. “Finite Automata Decomposition for Flexible Manufacturing Systems Control and Scheduling,” (with H. Darabi) IEEE Transactions on Systems Man and Cybernetics Part C, Vol. 33 Issue #2, pp. 168-175, 2003.